Actually, it is now the afternoon here in Kazakhstan but I have just had a good morning tidying up admin and uploading some photos to the site (here) from May. May, where on earth did you go?! It seems to have flown by, taking two countries with it, but leaving me with lots of stories and images of new experiences and lands. 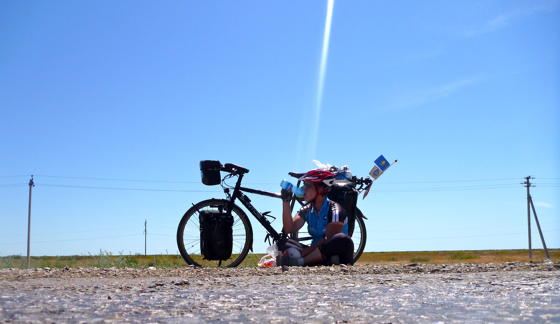 It has really been a story of people, this cycling lark, a real contrast to the ocean phases of the expedition. I am in Atyrau, a rather dusty city which sits just North of the Caspian Sea in the South West of Kazakhstan. During the Soviet era it was hugely important as a port town into the Caspian, but now the channels are no longer dredged and it is most important for its oil and gas, as much of this region is. It is significant too in that on one side of the river I am in Europe and when I cross shortly I shall be in Asia, the second continent of the expedition. 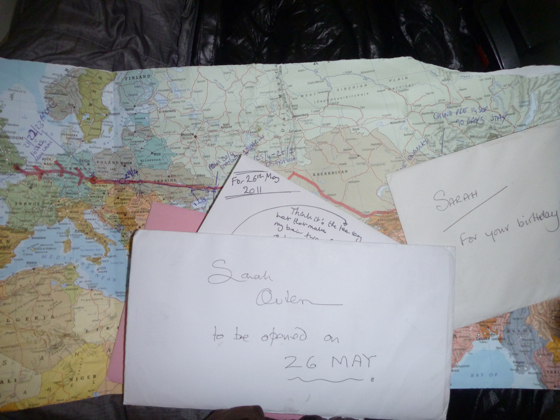 I have been here a few days now, having arrived in the cool of night last Thursday May 26th after the longest pedal of the journey so far. 210 km through the Kazakh steppe and semi desert, sweating through sweltering heat and pushing into cheeky headwinds at times. Having intended only to stay for 36 hours I have been kept here by bits of kit admin, lovely expat hospitality and a shout out from my body saying that it was rather enjoying the rest, especially as my cold seems to be lingering on. I always find it surprising how fatigue, both mental and physical, catches up with you when you stop and rest and you realize just how hard you have been working. The extra time preparing my kit and sorting out bits and pieces to send home is really valuable, too as the next phase will be one of the most challenging sections of cycling of this leg to Japan. Extreme heat, poor road surfaces (or indeed no road surfaces!) and long distances between towns and water stops mean that I need to carry extra food and water over what I would normally carry. The other day, for example, I had a 150km gap between water stops, so carried ten litres – Hercules looked like a heavily laden pack horse with water bottles strapped on and panniers bulging. Just as Ukraine was a country of contrasts for me, Kazakhstan really feels like a whole new world as well. It is wonderful and feels like the adventure has really started now, making me realize that Europe was a rather gentle introduction to life on the road. That said, Germany’s hills made me sweat! 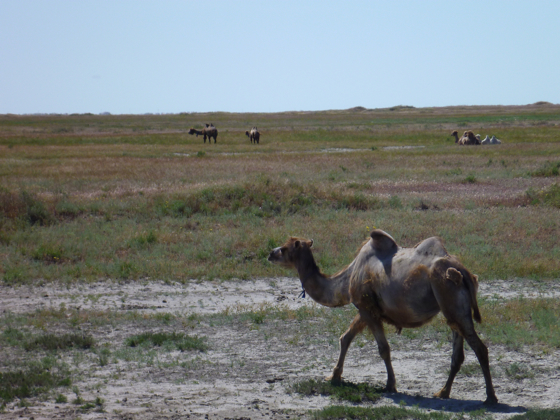 I am especially keen on the new wildlife of late – camels, snakes, terrapins and lots of new birds and insects. 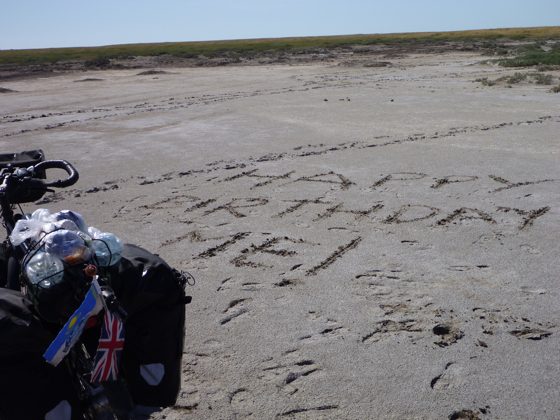 I am preparing a little video to upload in the next few days as a round up to the first two months of the expedition, but for now thought I would touch base with a few photos from my first ever Kazakh birthday. 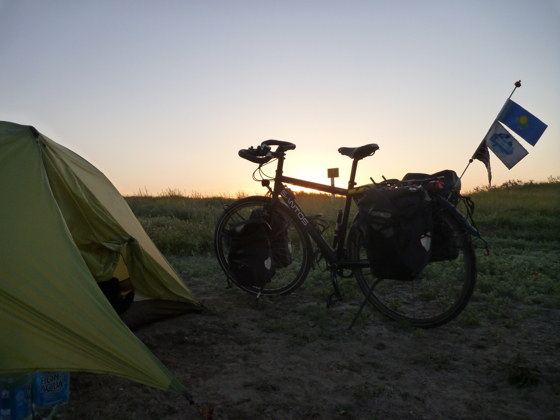 I rose early with the sun at 0530 and was away pedaling by 0700. 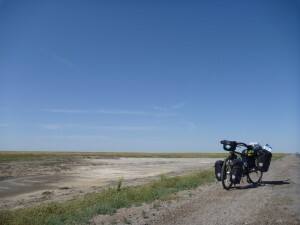 It was 210km to Atyrau through the steppe. Dried out lakes left mud flats across the landscape, which was otherwise a mix of greens and yellows with the spring flowers and grasses. Soon they will all be brown, dried out in the heat which will rise from its current 35 degrees into the forties. Apparently it is unusually cool for this time of year. Now its time to hit the road again – I have itchy feet and don’t want to lose the rhythm of the ride. 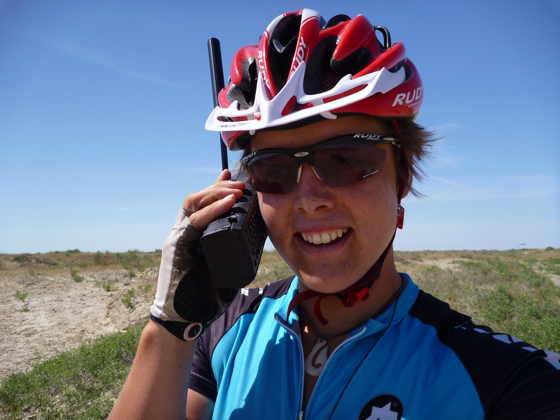 I also need to be in Almaty in three weeks to meet Justine, our team camerawoman, who will be flying out to join me on the bike with her camera, so we’ve some miles to munch. PPS Huge thanks to everyone in Russia for their warm hospitality – those who escorted me in police cars or on bikes, hosted me in their hotels or their homes, showed me their cities, stopped to offer me food or drink at the roadside or just tooted and waved to say hello. It was an extraordinary experience and I was really touched by it. PPPPS We’ve clocked 5424km on the bike since Calais. Just another few thousand to go! Good luck on your next section Sarah. Hope all will go well, considering the lack of organized roads ahead of you. as one of the Atyrau cyclists, and knowing a little myself of how it is to be cycling with all your gear on the bike etc. I wish you all the best for the rest of your trip, well done! 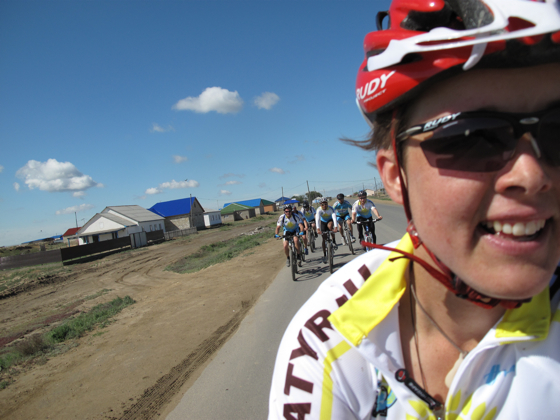 Great to meet you on Sunday and hear some of your stories while we cycled to Peshnoy. Hope you enjoy the TeamAtyrau cycling shirt! We met only met once or twice. I enjoyed reading ‘A Dip In The Ocean’ recently and now I’m tracking your current progress through this brilliant website. Well done on getting so far and happy cycling for the next phase. What a credit to are to all of us, so inspirational in many ways. Enjoy the hospitality of those who help you, we shall all I am sure look forward to reading about your travels at the end of your journey so you will have to write another book. Lots of love and good wishes for now. Hi Sarah!!! I saw you today in the steppe of Actobe. I’m doctor Dima. We are photographed today. I wish you a nice trip=) I will be watching for your trip. Have a good time in the Kazahstan and good luck!! !